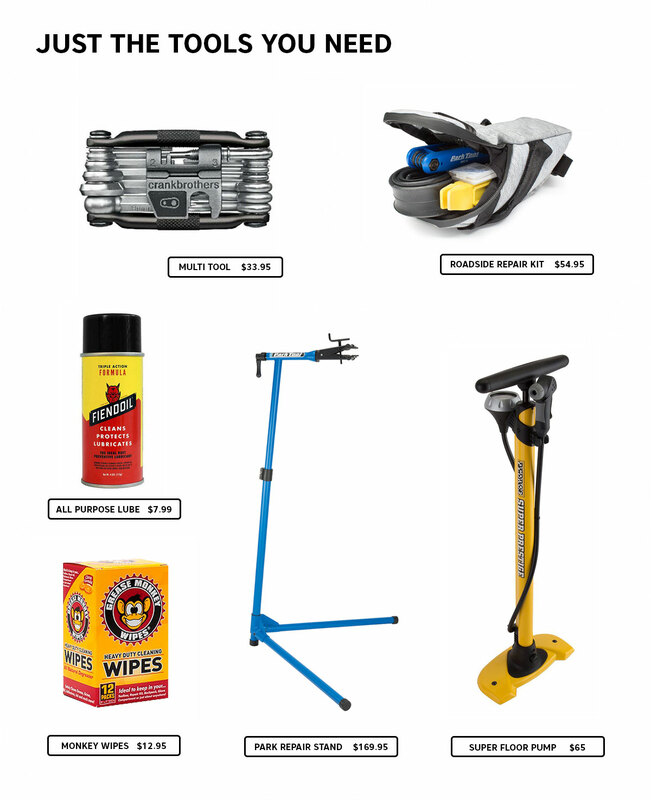 Whether your bike has been hibernating over the winter, or you have been pedaling through all the sloppy weather out there, now is a great time to give it a little love. If your bike was running well when you put it away for the winter, the job will be much more simple. If you have been putting it through the paces all winter long, your task will be a little more involved, but the overall steps are the same. Let's take a look at the key items you need to make sure of so that your bike is ready to ride when you are. Before getting on your bike in the Spring, or anytime, it is important to make sure it is safe to ride. These quick checks will ensure you have a happy ride. 1. Everything is tightened properly. Check your quick release levers or axle nuts to make sure the wheels are secured properly. Twist at and push down on the saddle to make sure it doesn't move in any direction. Twist at and push down on the handlebars to make sure the stem bolts are properly tightened. 2. Bearing surfaces are adjusted properly. Pick up the bike and spin each wheel one at a time. The wheel should spin freely without binding or making a grinding noise. With the wheels stopped, wiggle them from side-to-side, the hub bearings should not allow play in the axle. If the wheel is hitting either your brake pads in one place, or stopping prematurely, check your spokes to make sure none of them are bent or broken. If your wheel doesn't roll straight or has a broken spoke, you will need a mechanic to true your wheels. Grab the front brake lever and push the bike forward and back. The headset bearings should not allow the fork steerer tube to jiggle inside of the head tube. Pick-up the front end and turn the bars side-to-side. The headset should feel smooth. Pull the crank arm side-to-side. The bottom bracket bearings should not allow play in the cranks. Spin the crankset backward. The bottom bracket bearings should allow the cranks to spin smoothly. 3. Brakes are adjusted and brake pads still have life. When you squeeze your brake levers, they should go 1/2 to 3/4 of the way to the grips. If your lever pulls all of the way to the grip, your brake cable will need adjustment. Look at the brake pads. You should see wear indicator slots in the pads. If those slots are gone, if the pad is worn down to the metal holder, or if you can see any of the interior metal showing through the surface of the pad, they are too worn and need to be replaced. Want to know why brakes sometimes squeal and what causes it? Check it out. 4. Tires are properly inflated. Each tire has a different maximum PSI. For stock Handsome Panaracer Pasela tires, the max PSI is 95. You can find your tire's max PSI on the side of your tire. For the least resistance and fastest ride, pump your tires up to the max PSI. If you ride on uneven surfaces, you may find that a slightly lower PSI will make for a softer ride. Keep in mind that if you can easily push in the tire with your thumb, it is too soft and should be inflated to avoid pinch flats. Want to read more about why your tires lose air even when just sitting over winter? Check it out. The following steps will make your bike look great and ride smoothly and quietly. You've already made sure your bike is safe to ride. Now let's make sure it is fun to ride. You don't have to completely take your bike apart to clean it properly, but it does make it easier if you remove the wheels. If your bike has a ton of dirt and grime, we like to use a grease cutting cleaner like a citrus degreaser or even a solution of warm water and dawn will work. Spray the solution onto your bike wherever you see dust, dirt or grease. Clean your bike the best you can. Don't worry about the lubrication, we will make sure it is properly lubricated later. For a final coat and to help make your frame easier to clean later, I like to use a coat of Pledge on the frame set, then wipe it off. **NOTE** One area you don't want to leave any liquids behind is on your brake pads or rims. Make sure you wipe off any and all cleaner you use. There are certain areas that need lubrication from time-to-time. Your chain should be cleaned and lubricated. Ideally, the interior part of the chain will be lubed, and the outside (that doesn’t touch the chainring or cogs) should be clean. The pivot spots on your brake arms (where they move on the frame or fork) need lubrication. Try to shoot the lube into the gap between the brake arm and the post that holds them. Squeeze the levers as you do this so that the lubrication makes its way inside. Wipe off any excess and try not to get any on the brake pads or rims. If you have derailleur(s), they need lubrication as well. The spots to hit are where they pivot. Get the lube in there and wipe off any excess. 3. Check the bolts on any accessories. Most of the time you can tell if the bolts that hold on your accessories are loose by dropping the bike gently on the tires and listening for rattle. You can also just push and pull at the accessories to see if they move. If they are loose, tighten them up. Inspect for any signs of failure and of course do not ride with loose or failing parts or accessories. 4. Pull out your seat post and put some grease in there. If it is your bike, and you have had it for a while, there is a good chance that you have not had to raise or lower the saddle. Over time, the grease that was used when your seat post was first installed (hopefully they used grease) will dissolve and then eventually corrosion will seize the post to the frame. That is something you want to avoid at all costs. Freeing a stuck seat post is one of the least fun things a bike mechanic is ever asked to do. From time to time, pull your post out, clean it off and apply new grease to the inside of the frame. **TIP** Before pulling out your seat post, take a piece of tape and wrap it around the post where it meets your frame. That way, you know exactly how far to put it back in when you are done.